When I was asked to take part in a pudding contest using Mermaid’s two pint pudding basin (RRP £15.99), I decided not to make a traditional Plum Pudding but still wanted to have a Christmas flavour and, after some thought, was inspired by the flavours of the Chocolate Orange. The Chocolate Orange is as much a part of Christmas as mince pies, Christmas stockings and Father Christmas. For years, you could only get a milk chocolate version of this favourite chocolate treat, but now there are so many different varieties, something for every taste. 1. 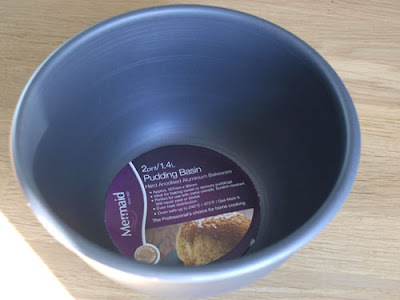 Butter a 2pint/ 1.4 litre Mermaid Pudding Basin and put a circle of baking paper in the base of the basin. 2. Cut 2 of the oranges into round slices (don't use the ends), put them in a pan and cover with cold water, bring to the boil and boil for 3 minutes to blanch them. Drain on kitchen paper. Arrange in the pudding basin. 3. In a bowl, mix the cocoa and sugar with a little milk until smooth, then add the rest of the milk..
4. Zest the third orange and stir into the mixture with the orange essence, breadcrumbs, melted butter and egg yolk. 5. Sift the flour and bicarbonate of soda and fold into the batter. 6. Pour the batter into the pudding basin. 7. Make a lid for the pudding basin: lay out a piece of foil and top it with a piece of baking parchment, make a pleat in the middle and lay it over the pudding basin, pressing it over and around the rim. 8. Take a piece of string and make a slip knot, place the loop over the pudding basin and tighten. Make a handle with the string so it is easy to lift into and out of the pot. 9. Place the basin on an upturned saucer or trivet in a large pan half filled with water. 10. Bring the water to the boil then simmer with the lid on for 1 1/2 hours, checking every 30 minutes to make sure it doesn't boil dry. Place the sugar and water in a pan, gently heat the water and sugar until the sugar is dissolved. Bring to the boil and boil for 5 minutes or until the liquid is reduced by half. Remove from the heat and add the orange segments, leave to cool for 5 minutes, add the brandy and chill the orange sauce. 11. Lift the basin from the pan and remove the foil lid. 12. Run a knife carefully around the inside of the basin and turn the pudding out onto a plate. 13. 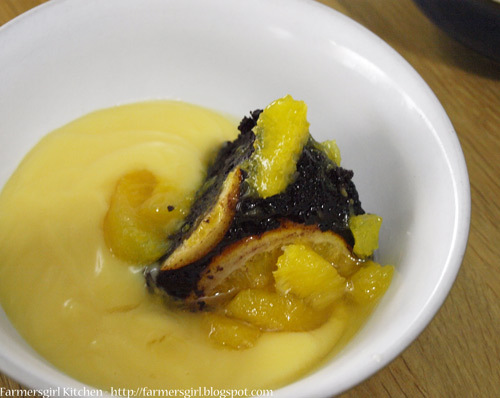 Serve the pudding with custard or cream and a spoonful of the orange sauce. I have to say that this was a total triumph! The pudding slid perfectly out of the Mermaid Pudding Baisin and the breadcrumbs in the pudding made it light and airy, but with a rich chocolate taste. This was perfectly contrasted with the sharp zesty taste of the oranges. I received the Mermaid Pudding Basin, I was not paid to write this post and all opinions are my own. Meanwhile... Janice makes a bloody amazing pudding. Chocolate orange is fabulous and a firm favourite of mine. It looks stunning too! Thanks Dom, it was bloody amazing, though I say it myself! That is absolutely spectacular Janice. i love the oranges so boldly on show. Janice this is brilliant!!! What a fantastic, inspired twist on a traditional favourite. Love, love, love! Oh look at this orange pudding. It looks fantastic. I will try it!!! 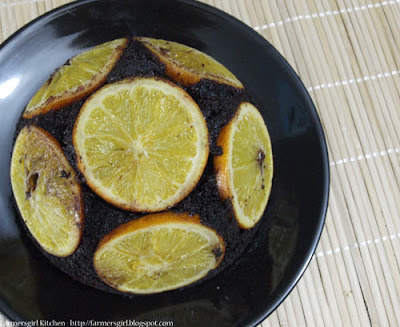 I love the combination of chocolate and orange - this looks amazing. I'd love to try it.